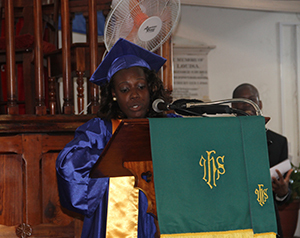 NIA CHARLESTOWN NEVIS (November 18, 2014) — Top student of the Charlestown Secondary School (CSS) Caribbean Certificate of Secondary Level Competence (CCSLC) Valedictorian Ochanta Parris expressed gratitude to teachers for her accomplishments and that of her fellow graduands when she delivered the valedictory speech at her class graduation on November 12, 2014. Parris also spoke of the pride she felt. “Achieving the first certificate in the Caribbean Certificate of Secondary Level Competence examination for CSS is indeed an accomplishment for us. I was literally forced by my teachers to do Spanish. It was with much fear I made the decision to forge ahead. Now I have no regrets. I understand that our teachers had faith in us. A working faith that caused them not only to believe in us but help us to do the work necessary for us to return successful results. To them we say thank you,” she said. 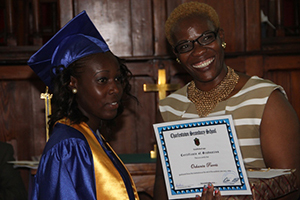 Parris also thanked their parents and their School Principal Edson Elliott. “It is truly our day. We can do what we want to do. This is our time. We can use it anyway we want to. This is our life and we are responsible for every action. This is our day, our time, and our life. I hope we all choose to use our life and our time wisely,” she said.